Pretty In Pink Dogs: Are chicken bones bad for dogs? Just in case you didn’t know cooked chicken bones are not good for dogs. 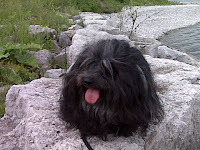 Raw chicken bones on the other hand are fine and make great treats for dogs, including my Havanese and Bololgnese. I give a raw chicken neck or chicken wing to my doggies once in a while and they love it. If I make a turkey, well, I need to cut the neck in half since it would be a lot for one dog and more than enough for two or three little dogs. Chicken necks are more cartilage than meet compared to the rest of a chicken carcass that has both meat and marrow. Eating a small chicken or a similar small animal is a natural thing they would each in the wild. Commercial dog food didn’t always exist. Cooked chicken bones are brittle and can splinter easily into sharp shards which my tear or get-stuck in their mouth, esophagus, or in their intestines. It can be life threatening for dogs. Now onto my story, the other day I purchased a package of chicken wings on my way home to include for dinner. I was by myself that evening and didn’t want to spend too much time cooking. Since I was by myself I ate in front of the TV. I can’t remember why I got up but I did. I put my plate with left over cooked chicken bones on top of several high boxes. I had thought there was no way my dogs, Caillee or Josie, could reach up and get at my plate. I came back to the sofa and continued to watch TV for a couple of hours more. I happened to glance over at my plate on top of several high boxes. I should point here were really wasn’t anything around these boxes to help small dogs get up to be able to reach this plate. I kept staring this plate and thinking something wasn’t right. Then it dawned on me; the plate was empty. I think blood rusted from my face as panic set in. I looked over to Caillee, the most like most likely suspect, and then I looked over to Josie. Both my doggie girls looked fine. I know neither of them had touched the plate while I had came back to sit at the sofa. Therefore, it had been at least a couple of hours since the event of the crime. I watched them for several days. I had watched for any signs of a temperament or personality change; do they continue to act themselves or do they act moody, tired, or just plain not themselves? So far they continue to act as normal as can be. I am not seeing any signs of listlessness, a major sign I should be rushing them to the veterinarian. I watched for any blood in their stool or if they had made a big effort to do “#2”. Should this happen to you, I suggest a phone call to your vet for suggestions or advise would be a wise course of action. In addition, doing a google search wouldn’t hurt either. I did one with the following keywords: cooked chicken bones + dogs + symptoms or in my case I did a similar search in a handy book I have about dogs and home care. It has been almost a week since this event happened and during that time, I think I was on pins and needles observing them and hoping for the best. My lessons learnt, those boxes weren’t high enough, not even for a minute which is how long I think I was gone. Put food away as if they were big dogs because I am finding my dogs can be very crafty and ingenuous. Always wondered how wild dogs/wolves could handle bones but our domesticated dogs weren't supposed to have chicken bones. Thank you for the information and tips on what to do if they do get into some. My Kleenex bandit's name is Josie. It wouldn't be so bad if they were the clean Kleenexes.